What is the Conventional Treatment for Hayfever & Allergies? How has SOS Hista Drops helped others? What do SOS HistaDrops contain? How do I use SOS HistaDrops? How long does a bottle of SOS HistaDrops last? Allergies are usually treated with drugs called antihistamines. Antihistamine drugs work by blocking the release of histamine in response to an allergen. This prevents the allergic reaction in the short term and helps to clear allergic reactions like sneezing, red, itchy and watery eyes and nose. However, antihistamines also often have unwanted side effects like drowsiness, heart palpitations, impaired concentration, etc. Because they often become less effective over time, it may be necessary to keep trying new drugs to try and achieve the same therapeutic effect. One of the most frequently requested remedies by our customers was for a safe and effective alternative natural remedy to treat hayfever and airborne allergies. Customers indicated a dissatisfaction with antihistamine drugs and a need to find an effective natural alternative. Many customers had previously tried herbal remedies for hayfever without much success. After researching various formulae, we arrived at the conclusion that the best effect would be achieved by combining herbal and homeopathic remedies for fast, safe and effective relief of the major symptoms of hayfever and allergic rhinitis linked to airborne allergens. 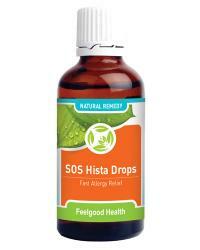 Manufactured in a fast acting tincture formula, SOS HistaDrops can quickly clear all the troublesome symptoms of airborne allergies, while also helping to strengthen your system against further attacks. SOS HistaDrops combine natural ingredients known for their ability to maintain balance in the immune system and to support histamine levels within the normal range – supporting clear eyes, noses and easy breathing. Manufactured in a fast-acting tincture formula, SOS HistaDrops provides on-the-spot support when you need it. This safe and effective natural formula can be used by adults and children. "These drops are fantastic! They work quickly and I can say that I feel more awake, rather than half asleep which is how the antihistamines made me feel. Thanks for a great remedy!!!!!!" "My daughter has been using your Allergiclear along with the Histadrops and we have noticed a big difference. Spring used to be a difficult time of year for her and now she is more outgoing and not sneezing all the time. We are very grateful for your help." "As a sportsman I am out in the open a lot and really can suffer from grass cuttings, pollen, etc. Indoors the dust gets to me. The HistaDrops really help to reduce all the sneezing, watery eyes, nose and redness. I carry them everywhere with me!" Urtica urens has been used for many centuries in folk medicine to treat inflammation and allergies. Modern research has recently supported its use as and effective anti-inflammatory and natural antihistamine. It is a rich source of quercitin, a flavonoid known to inhibit the release of histamine without the side effects of antihistamine drugs. Plantago lanceolata (also known as plantain) also has a long history of traditional use for the treatment of respiratory complaints, including coughs and inflammation and has known anti-catarrhal and antispasmodic properties. Plantago has been approved by the German Commission E to treat coughs and soothe the irritation of mucous membranes and is extremely effective in the treatment of allergic rhinitis due to its soothing and astringent properties. Allium cepa C30 is a homeopathic remedy which quickly treats stinging, burning, streaming nose and eyes and stops violent sneezing attacks, while reducing inflammation in swollen itchy eyes. Ars. iod. C30 is also homeopathically formulated to assist with all the symptoms of hayfever and allergic rhinitis. It can also help to reduce irritability and to prevent sneezing and a wheezing chest. SOS HistaDrops are taken when needed at the first signs of the symptoms of hayfever, allergic rhinitis or reactions to airborne allergens like pollen, grass seeds, house dust, animal dander, etc. They come in convenient drop form, making it easy to adjust the dosage for adults and children of different ages. Simply dilute the drops in about 1/4 cup (less for the younger child) of water or juice. Note: SOS HistaDrops offer fast symptomatic relief from symptoms of hayfever, allergies and allergic rhinitis whenever you need it. In order to balance, strengthen and support the system against allergies, we recommend regular use of AllergiClear tablets as a preventative treatment for allergic conditions. See our Special Combo Pack and Save! Safety during pregnancy has not yet been established. Pregnant women can use our Triple Complex BronchoSoothe as an alternative. Like all natural tonics, SOS HistaDrops gets to work quickly, and results may be noted as soon as 10 – 15 minutes. Some people may require a second dose after about 30 minutes. One bottle of SOS HistaDrops will last approximately 1 month, depending on age and frequency of use.